CRA Traccess 230 hire – Call for our best prices. The Traccess 230 is an exceptionally versatile piece of equipment, offering excellent reach and stability to work in virtually any environment. 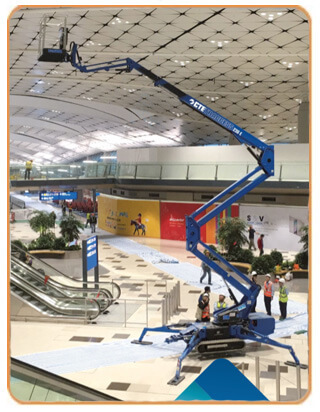 With a working height of 23m, a double pantograph, telescopic boom and jib, and 360°C non-continuous turret motion, the Traccess 230 makes light work of building maintenance, landscaping, high-access installations and much more. Available in motor-powered (diesel or petrol) and electric (lithium battery) models means that the Traccess 230 can be cost-effectively and safely used indoors and outdoors, while it’s folded measurements (less than 2m in height and 0.8m in width) means that it can easily pass through standard doorways. The lithium battery is ideal for working in noise or emissions-restricted areas and up to 5 hours of continuous work. With the help of your MC equipment hire operative, within a few minutes the spider Traccess 170 changes: usually used with the basket for lifting materials and operations. The outreach capacity of this machine allows users to reach some of the most difficult spaces. With it’s boom configuration – double pantograph, telescopic boom and jib – it is extremely versatile. It also folds down to fit through a standard sized door. Click here to see full technical specifications of the CRA Traccess 230.